Following the AVB Networking Conference held at InfoComm12 on June 12, co-sponsors Avid, Biamp Systems, Extreme Networks, Harman, Lab X Technologies, Meyer Sound and Riedel Communications, all of whom have AVB-capable devices in the market today, stated that a full house in attendance included market leaders from the systems integration community. Co-sponsors Avid, Biamp Systems, Extreme Networks, Harman, Lab X Technologies, Meyer Sound and Riedel Communications reported a full house in attendance at the AVB Networking Conference during InfoComm 2012. The conference included technology leaders from a host of disciplines and applications including Bill Murphy, director of solutions marketing, Extreme Networks who discussed the core AVB technology; Jim Risgin, vice president engineering, On Stage Audio, who presented on his pioneering work with AVB in real-world applications; Vikram Kirby, director of technical design, Thinkwell, who spoke from his experience deploying AVB in the field; Sam Berkow, principal consultant and founding partner, SIA Acoustics, spoke regarding AVB in large performance venue design; Michael Cusick, president, Specialized Audio Video Inc., who addressed AVB in hospitality system design and Casey Sherred, consultant, Acoustic Dimensions, who highlighted AVB in house of worship design. 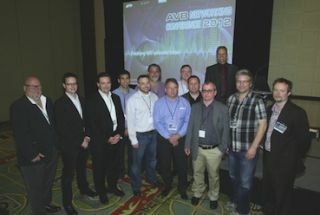 "The AVB Networking Conference at InfoComm not only delivered a comprehensive and accurate overview of the technology landscape as it is today, it also provided a window into the tremendous potential of AVB to enable advanced audio video networking for an increasingly broad array of applications in the immediate future — and beyond," said guest speaker Sam Berkow. "The energy and quality of the dialog with the audience during the various sessions was fascinating and encouraging. I am grateful to the organizers and the attendees for making it such a rich and valuable experience and I would happily participate in another event of this caliber."